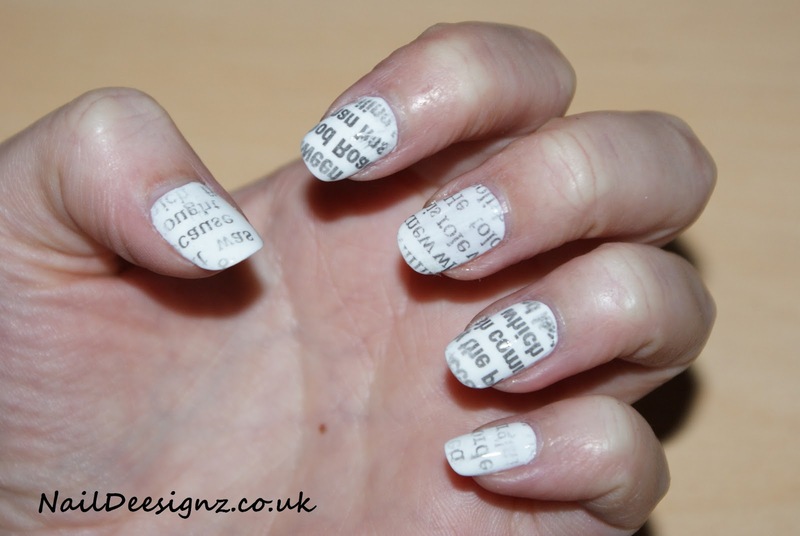 Tip 1 - When cutting up your bits of newspaper for this design, try to choose bits of text with the same font (as you can see from my picture 2 of my nails are darker than others.) It would look better if it was all the same font. Tip 2 - Cut pieces of text without a line blank (paragraph) because otherwise you end up with a big gap in your design. Tip 3 - Nails must be COMPLETELY dry before starting with the newspaper. 1. Make sure you have 10 (+a few extra in case of mistakes) bits of newspaper cut up ready to use. 4. Slowly peel off the newspaper and you should be left with the newspaper print on your nail. 5. Leave nails for quite awhile before applying top coat, because otherwise the ink will smear. Although this is an easy design to create, it is difficult to try and explain step by step. At some point I intend on taking photos of my step by step to help illustrate it. Please post your photos to me if you try out this design. If you need any other tips then please comment and I will reply. It takes practise so don't give up! :) .x. WOW wonderful idea! I tried at at my friend's house and it turned out great!!! I am so pleased it turned out well :) It takes a bit of practice to get it right.